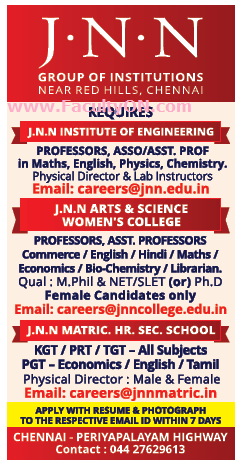 J.N.N Institute of Engineering, Chennai has advertised in THE HINDU newspaper for recruitment of Professor / Associate Professor / Assistant Professor Plus Non-Faculty jobs vacancies. Interested and eligible job aspirants are requested to apply within 07 days from 17th June 2018. Check out further more details below. About College: J.N.N Institute of Engineering is an engineering college located in Tiruvallur, Tamil Nadu, India. It is approved by AICTE, New Delhi and affiliated with Anna University, Chennai.